It’s safe to say that technology is shifting the way large organisations market their brands. Companies with traditional and well-honoured principles have had to slowly navigate their way into the online arena in a more strategic way – ensuring that they adopt the technologies and approaches that will allow them to deliver on their overall business objectives. As consumers increasingly use the internet to research and buy products and services, competition for attention has increased. As a result, digital marketing leaders are now being recruited to top positions in key corporate sectors and the online visibility of major global businesses is now considered a top priority. TranslateMedia has analysed the websites of the companies in various sectors of the Global Fortune 500 to investigate which technologies are being used to power their websites and engage with audiences around the world. Paid advertising is now commonplace. According to Statista, global digital ad spend is predicted to hit $191.58 billion in 2017 vs. $148.66 billion in 2015. From PPC campaigns and display ads to paid social media, large companies are now using a wide range of advertising technology solutions to improve brand awareness and increase sales. Our research shows that Google’s DoubleClick is the most popular advertising technology for all of the sectors analysed. 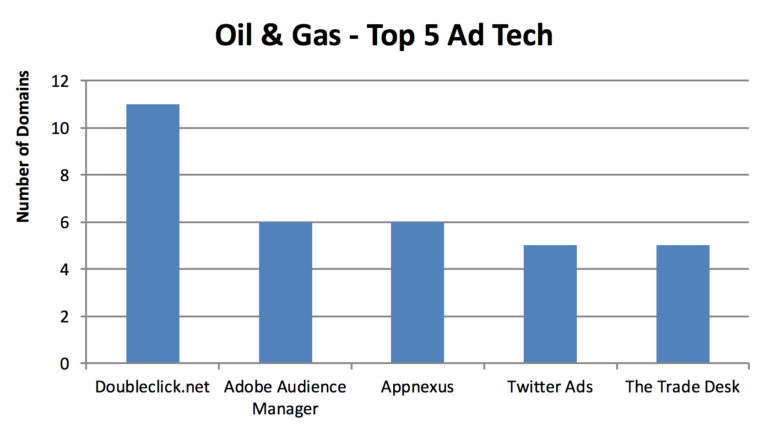 Adobe Audience Manager and Appnexus are also popular choices for online advertising. 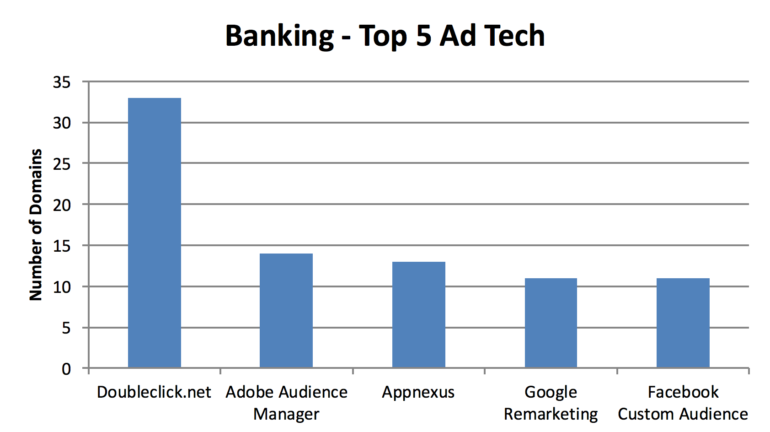 While online advertising is commonplace in the Personal Goods industry (consisting of Fashion, Beauty and Personal & Healthcare brands), the Banking sector is seeing substantial adoption of digital advertising with over 60% of global financial institutions we were able to analyse using multiple advertising technologies on their corporate websites. Adobe Audience Manager is the most widely used advertising tool in the Banking, Oil & Gas and Mobile Communications sectors. The data management platform helps build unique audience profiles to identify the most valuable segments and use them across any digital channel. AAM uses online, offline and third-party data to create unique customer profiles in order for companies to effectively fine-tune their ads to a specific audience segment. These customer profiles are then used within ad networks like DoubleClick and Appnexus where users are then targeted with ads that best suit their customer profile. Social media advertising platforms also rank high with most companies using them as an intrinsic part of their marketing strategy. Both Facebook and Twitter have their own bespoke platforms that allow companies to target specific demographics or user interests to optimise their ad campaigns. With 1.13 billion daily active users, Facebook’s Custom Audience allows a company to create a specific ad group from a company’s customer database or match them with ‘lookalikes’ of registered users to further increase reach among like-minded individuals. The Banking sector is also starting to recognise the potential of these platforms not only for marketing but to optimise customer service, help new product development and at the same time, reshape the business model that has been relied on in previous decades. 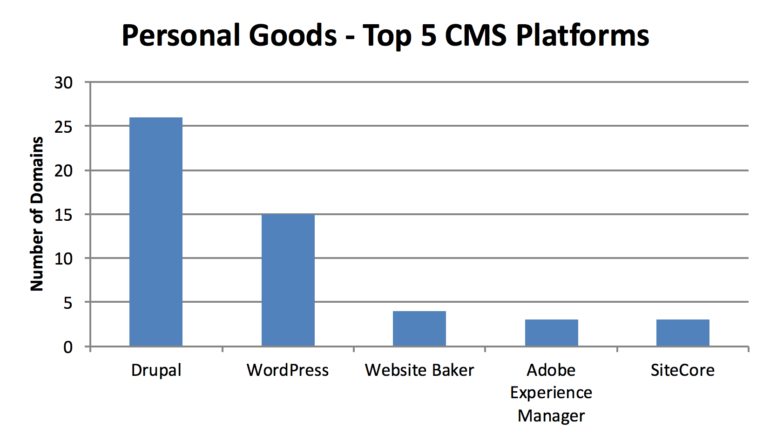 There are many content management systems (CMS) on the market. Companies can use these CMSs to create highly dynamic content-led websites to promote a company’s brand and its products. Attention to ROI is a fundamental feature of a corporate marketers digital strategy and companies that don’t have a sole eCommerce focus tend to opt for enterprise CMSs. These cost-effective content management systems allow companies to create websites without having to pay annual licensing fees. 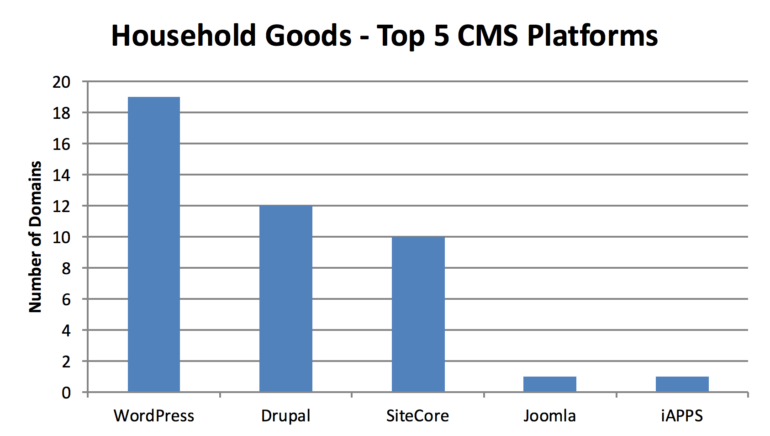 Overall, the top CMS in our analysis was Drupal with WordPress ranking top in the Household Goods sector. As an open source platform, Drupal sets itself apart from most others by having one of the largest open source communities in the world. The platform is used by 55% of companies we were able to track in the Personal Goods sector of the Global Fortune 500. With over 1 million designers, developers, editors and strategists, Drupal is one of the most flexible platforms on the market allowing companies to create a website that can manage high levels of traffic and support huge volumes of content. WordPress (another open sourced platform) is well known for its user-friendly interface and large community-based support network. With a wealth of free plugins to power it’s hosted websites, it’s a great solution for corporate companies to showcase its brands online and meet internet best practices without compromising its corporate brand aesthetic. While companies large and small have a vast number of CMS platforms to choose from it’s important to recognise the other tools used in order to engage with users and track their activity. These range from eCommerce integrations and tag management solutions to social media widgets and other third-party plug-ins. Most of these tools are working hard in the background to give the user a better online experience while providing the website owner with a wealth of user data to be used at a later date. 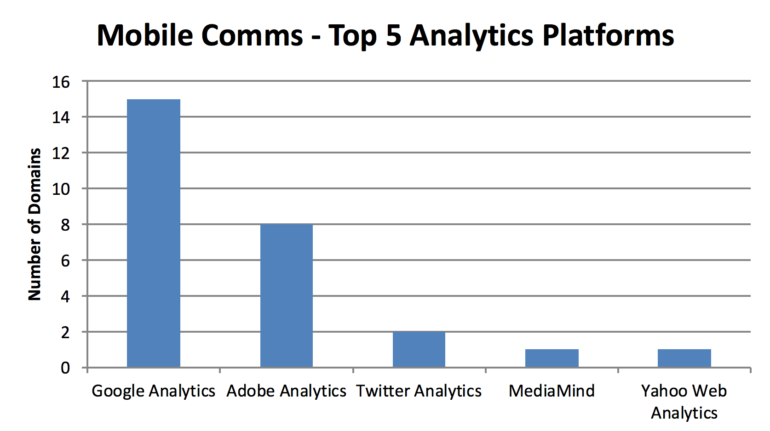 Google Tag Manager is one of the top 3 tools used in all the sectors we analysed. The tag management tool allows website owners to manage tags and snippet code to help integrate third party applications on their website. Email service providers, social media ads and analytics tools all need small bits of code to be added to a website so that they’re fully integrated to track user behaviour. In the past this would be added by a developer however, Google Tag Manager allows a marketer to add and manage tags and code snippets all in one place. More importantly, tags can be implemented without the help of a developer and it’s this very reason why the tool ranks so highly in all sectors. With social media increasingly becoming an integral part of business strategy – social share plugins are also commonplace. Facebook is a key player in almost every sector and is the top plug-in used in the Personal Goods, Mobile Communications and Household Goods sectors. It also seems that video embedding is a major feature for companies in the Household Goods sector as the YouTube iframe ranks second after Facebook. A sophisticated eCommerce platform is critical to the success of online retailers and businesses in the personal goods sector. Smaller businesses are increasingly using platforms like Shopify however from the Global Fortune 500 companies we were able to analyse in this sector, 33% of companies are using their own bespoke eCommerce platforms topping the list over solutions from the likes of Demandware and Magento. It seems that companies in this sector are likely to invest more in bespoke solutions with their developers to cater to their specific transactional needs, rather than opting for off-the-shelf eCommerce platforms with generic functionality. This could also be due to a company’s unique finance or logistic back-end process which has to be integrated into the eCommerce platform. 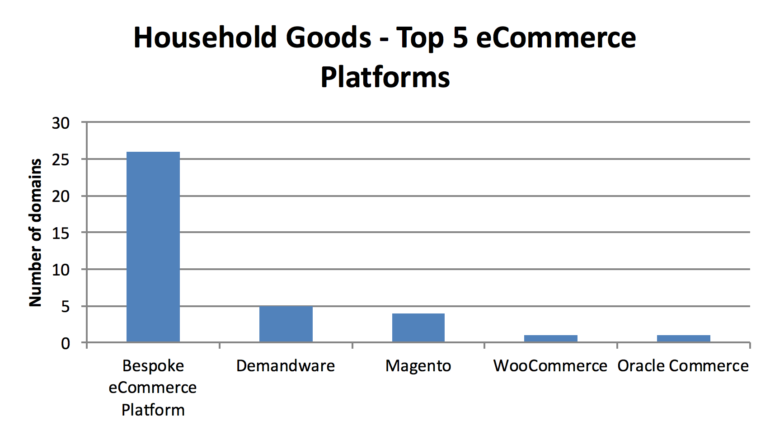 Bespoke platforms are also highly favoured in the Household Goods sector with 46% of websites investing in tailor-made platforms. This isn’t surprising as the websites in this sector are similar to the Beauty and Personal & Healthcare brands in the Personal Goods sector. What’s interesting is that the majority of these websites aren’t necessarily fully transactional. They have the functionality of a traditional eCommerce website however, rather than adding a product to the basket the user is redirected to a stockist where they’re able to purchase the product. Big businesses gather big data so it’s important for them to analyse the digital data accumulated in the right way in order to find actionable insights. While some of the big software CMS and eCommerce technology providers offer additional in-depth analytic tools, Google Analytics still ranks top in all the sectors in our research. Google Analytics seems to be the undisputed leader of website analytics, it offers a free version, it’s powerful and now offers a subscription service for enterprise users and a version for mobile apps. Over the years Google Analytics has invested in the development of additional tools such a Google Tag Manager as previously mentioned, but also Google Optimize and Google Data Studio which allows the reporting process to be less laborious giving more time to focus on delivering actionable insights. While Google Analytics is the leader in the web analytics market, it’s also important to realise that most businesses also use other data tracking tools provided by their CMS platform even if it does come at a small cost. Companies in the Banking sector seem to be using both Adobe Analytics as well as Google Analytics to report user behaviour. Actions will be tagged differently on two platforms and it’s vital for big businesses to have a backup when it comes to their digital data analysis. 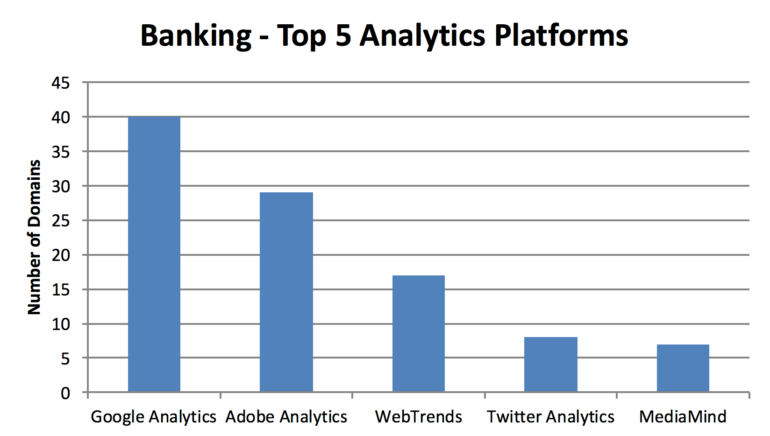 Other tools that are widely used in all sectors are Facebook and Twitter analytics. As more and more businesses decide to increase ad spend in social media, both Facebook and Twitter have developed impressive built-in reporting in their advertising dashboards allowing marketers to have an easy view of the metrics of their paid social campaigns. From the sectors we looked at it seems that the well-known platforms obviously take precedent within digital marketing, content management and analytics. What’s interesting (but not surprising) is Google’s dominance in the digital landscape and how marketers are successfully navigating its ever changing development. With Adobe’s acquirement of companies like DemDex leading to the expansion of Adobe Marketing Cloud, the multinational software company can offer content management, digital marketing, analytics and ad buying solutions all in one place. A key trend we found is that companies will commonly use multiple platforms for online advertising. A prime example is the Mobile Telecommunications sector where DoubleClick ranks top however, companies are also using App Nexus, Twitter ads, The Trade Desk and Adobe Audience Manager for their online advertising solutions too. All in all, it seems that companies are now starting to grow their business on an even playing field in the world of online advertising and analytics. With a wealth of free and paid applications to aid marketers in engaging with customers and social media emerging as the next big marketing channel, it seems that big businesses are adapting to changes in technology and setting themselves up for continued global success in the near future. How Will Emerging Markets Respond to the Rental Wardrobe Phenomenon?